Infographic was originally published at Blinds-Hut. Most people’s homes can become cluttered from time to time. Whether it’s last night’s takeaway box or the countless pet toys that make their way around your home, it’s easy for it to build up. There are several detrimental health effects that have been associated with the amount of clutter in your home. 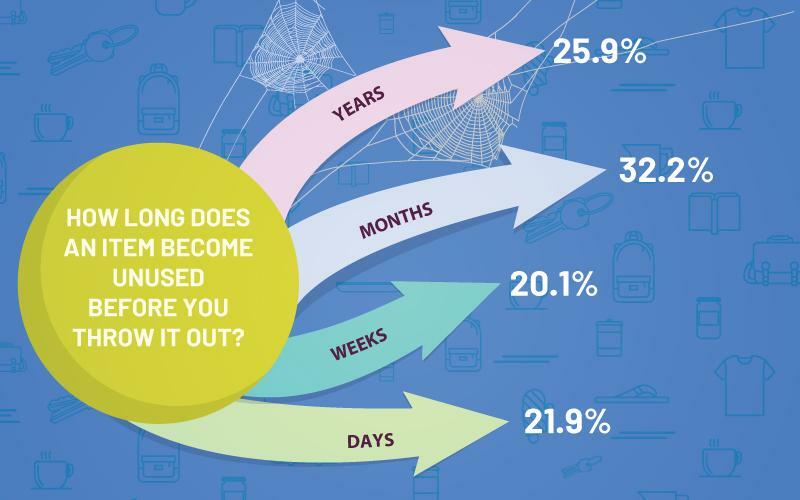 Blindshut conducted a survey to find out how clutter is affecting Brits, how they deal with clutter and is it a major factor in their lives. Some of the results were shocking. Clutter bombards our minds when it surrounds us. It causes our senses to work in overdrive and when this begins to build, stress can begin interfering with your ability to lead a normal life. You might begin to feel fatigued, irritable and find it hard to concentrate on the smallest of things. 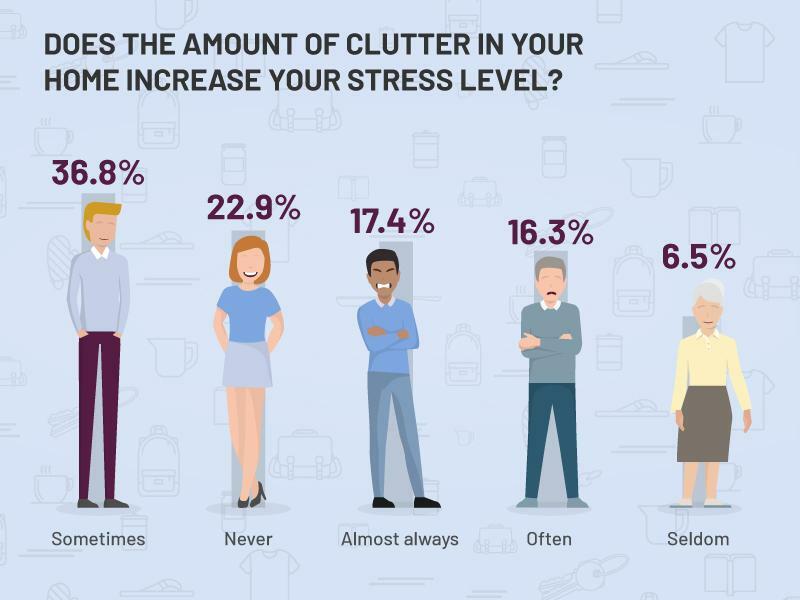 Nearly 1 in 5 Brits told us that clutter is almost always increasing their stress levels. As well as overtaking our physical space, clutter can overtake our minds as it causes our senses to work overtime to try to process what needs to be done. Following on from this, it is then difficult to focus on tasks as clutter is distracting. It can cause frustration when items can’t be located quickly or easily. Clutter can lead to you feeling overwhelmed. 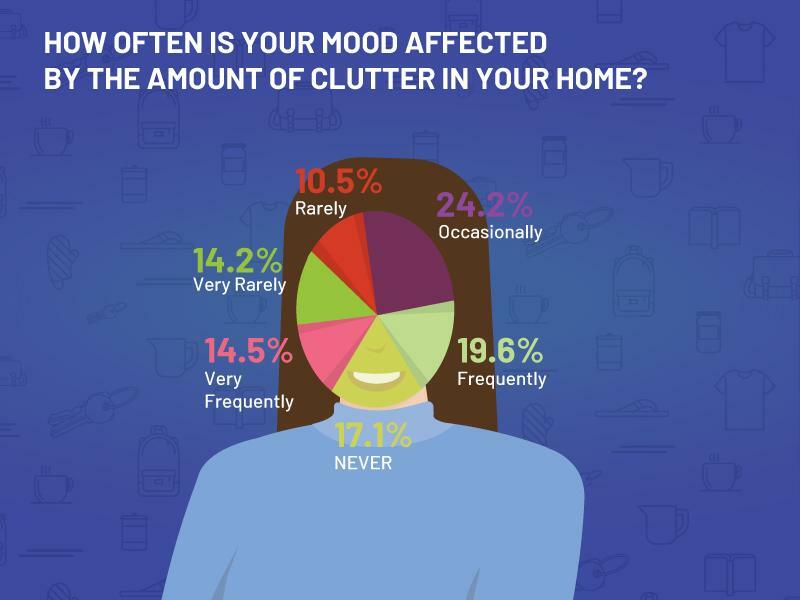 Over 82% of Brits’ mood is affected by clutter in some way. If clutter is allowed to pile up, it can often feel like it’s impossible to clear it on your own, so the problem becomes worse as the pile builds. A messy room sends signals to your brain to take action, but it’s up to you to act on those signals. 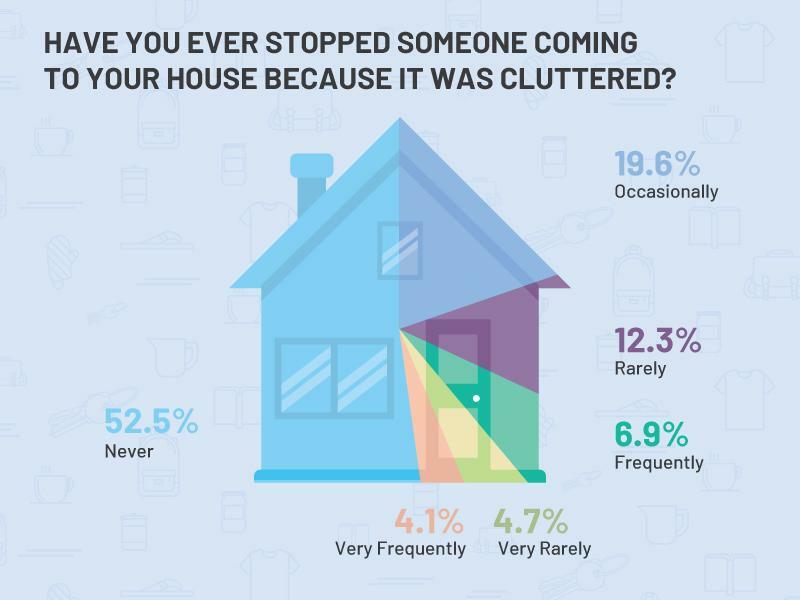 Over 47% of the public have thought twice about inviting someone to their house because of the amount of clutter. This is often because clutter is seen as a negative or embarrassing thing, but it’s easy to end up with a cluttered home if you don’t keep on top of it. Researchers at Yale School of Medicine found that people who are hesitant to throw out their junk show increased brain activity in two parts of the brain responsible for cravings, conflict and pain. Ben Edwards, a self-confidence expert and relationship coach, tells us “Our environment reflects our state of mind, which impacts our relationships, work life and productivity. You can tell a lot about a person from their home; if they have a minimalist, clean house, this often means that they like to keep their thoughts organised too. However, it could mean the opposite! This could mean they have a lot going on in their head, and this is a way of counterbalancing that. Meanwhile, people who may feel they haven’t got a lot going on in their lives might hoard as a distraction technique”. According to a recent Pew Research poll, sharing the household task of clearing clutter and doing chores is the third most important factor in a successful marriage. Clutter can become a regular topic of disagreements with the people you live with. 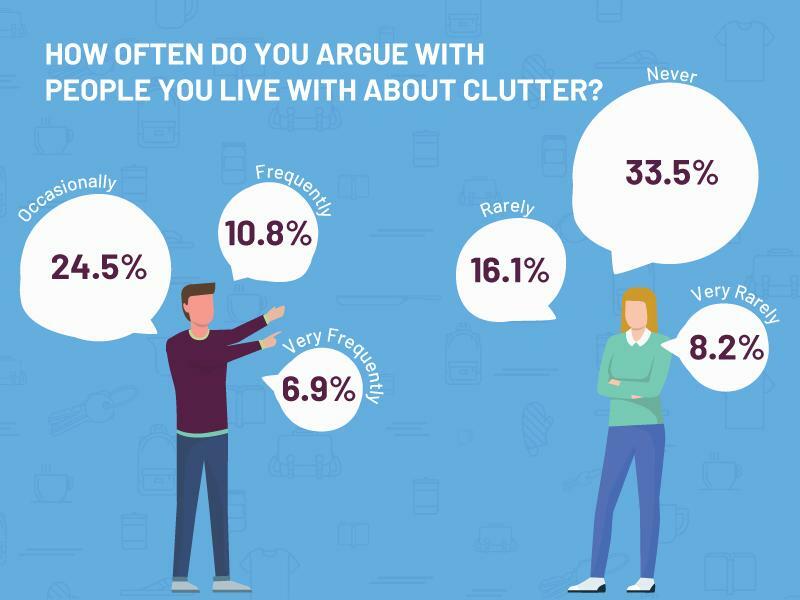 In the survey Blindshut conducted, 66.5% of people admitted to arguing over clutter with a cohabitant, with over 10% of people arguing about clutter frequently. Household chores are an essential part of keeping your home clutter-free. By completing them regularly, it will help you stay on top of your clutter. 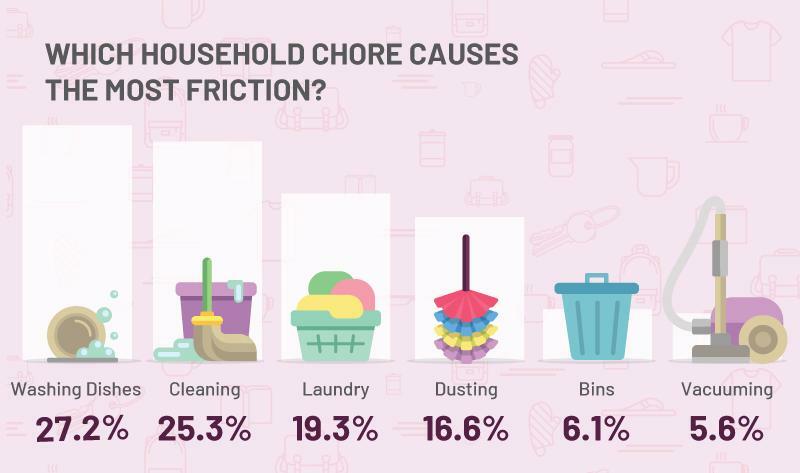 Over a quarter of Brits says that washing the dishes causes the most friction in their home. A recent study by esure insurance showed that British couples spend around 40 minutes every day arguing about household chores. Arguing with your partner causes your stress levels to skyrocket and your heartbeat increases considerably. 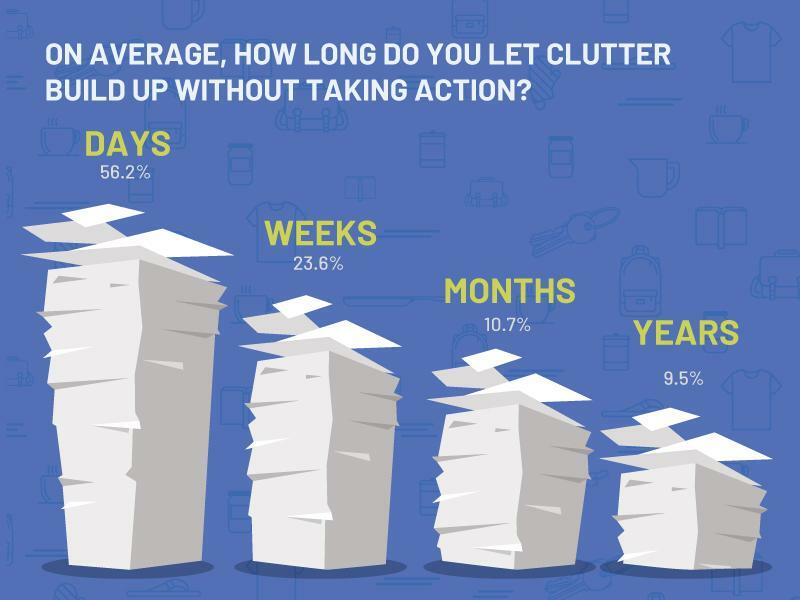 One in 10 of the British public wait months before dealing with clutter. 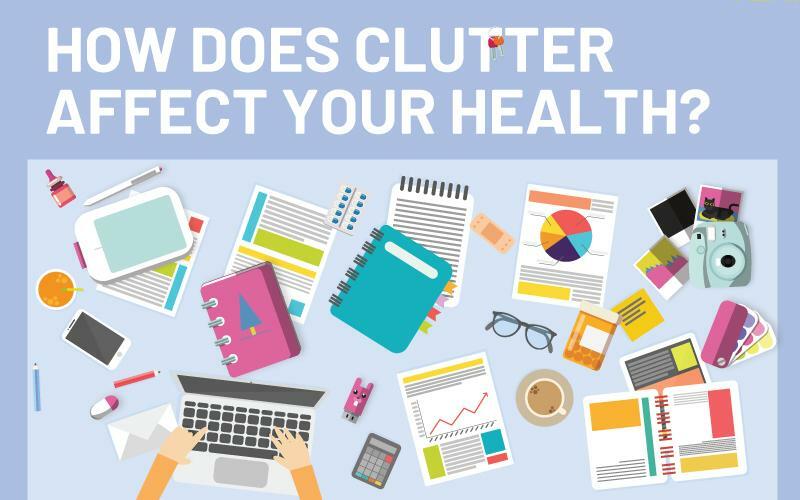 Depending on how long you let clutter build in your home, the health effects can become more substantial. A 2017 study found that a cluttered home can promote overeating or binge eating. It can also cause more accidents as the chances of tripping over clutter increases as it builds up. One of the reasons that clutter builds is because it can be hard to let go of an object. Over 25% of people surveyed said that an item can be unused for years before throwing it away. This leads to a constant build-up of clutter in a quarter of British homes. Excessive clutter can adversely affect air quality and lead to a pest infestation, both of which have a detrimental impact on health. As well as the exercise you get from cleaning your home regularly, a study at Indiana University recently found that cleaning your home lowers stress and fatigue levels as when you live in a messy home, you are subconsciously reminded of work that needs to be finished. Work surfaces that are regularly cleaned can help lessen the spread of germs, with the kitchen being the prime target because of the amount of food and liquid in the area. Over 7% of Brits admitted to cleaning their home yearly. A clean home also helps to alleviate allergy and asthma symptoms. A cluttered home can also make it difficult to fall asleep, according to Cath Hindle. “Interestingly, several studies have shown that seeing clutter sends a signal to our brains that our work or tasks are unfinished which in turn makes it difficult to relax or fall asleep. A cluttered space makes you feel restless. People with a cluttered bedside table are likely to have a more interrupted sleep, go to sleep later and wake up earlier. In a cluttered home, it can be hard to find the objects you’re looking for. This can cause anxiety if you’re late for work or can’t find what you need for a certain activity. Over 86% of survey participants told us that they struggle to find objects around their home, with over a quarter of Brits occasionally finding objects hard to find. “Clutter can impact your ability to focus on daily tasks and sap your creativity and productivity levels. Think about the areas of your home that you use for work or general admin and planning – perhaps a home office, kitchen table or a corner of your living space – are these areas kept clean, tidy and well organised? Clutter in your home is also a hindrance to relaxation and can impact the quality of your sleep. This is particularly true for clutter and mess in the bedroom, so decluttering here will help you create a peaceful ’sanctuary space”, says Alexandra Lees, co-founder of Wu Wei Wisdom. Your wardrobe is perhaps the best example of the kind of life you lead when it comes to clutter. Clothes tick all the boxes when it comes for reasons to keep hold of them: they can be sentimental, you might be able to fit back into them in the future, the item is barely worn and is seen as a waste of money, they suit a certain event or occasion, you’re keeping the item “just in case” or an item was a gift and you feel guilty about throwing it away. Nearly a quarter of Brits told us that they have only worn a few (less than 25%) of the clothes in their wardrobe in the past year. Recent research suggested that Britons keep £10bn worth of unused clothes in their wardrobes. If you’re thinking about beginning to declutter, Cath Hiddle of Clear the Clutter suggests “As with most projects, it’s probably a good idea to start off small. Pick a drawer or cupboard and start with that to ascertain how easy you find it to sort through your belongings and decide what is important and whether you can sort and organise them in a logical way that works for you.